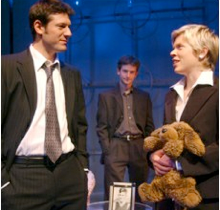 After the successes of his "Therac 25" and "Zadie's Shoes", the opening of Adam Pettle's "Sunday Father" became one of the most anticipated in the 2002-03 season. It is a solid play with a trio of fine performances, but the comparison every playwright dreads to hear cannot be avoided. "Sunday Father" may be good, but it's not as good as "Zadie's Shoes". The play concerns two brothers, Alan and the younger Jed, who have been best friends and rivals since childhood. Their lives have both been scarred by their father's decision to leave their mother for another woman. In the terms of the visiting rights in the custody agreement, he became the "Sunday Father" of the title. The father's unaccountable coddling of Jed and neglect of Alan, who works in his father law firm, has generated a tension that still shows in the horseplay and aggressive joking of the boys now in their thirties. A double crisis arises when Jed discovers that his wife Amy has been having an affair with a former boyfriend and when Alan finds that his father is supplying no support in an upcoming deal that will make or break his career. Pettle's focus is clearly on the two brothers, both as we see them now in flashbacks to them when they were young, taping their own private radio show, "The Sunday Night Files", that increasingly serves as a reminder of not just of friendship but rivalry. If fact, Pettle focusses so much on their joking that he neglects elements of the plot. How could a health care worker like Amy, who is supposed to be both intelligent and overworked, be so stupid or have the time to carry on an affair, much less have trysts in her own house? Pettle wants to show that Jed, in separating from Amy and fighting for custody of their child, is in danger of repeating the same mistake his father made. But that should not mean that Pettle neglect to give us any insight into Amy's character. "Therac 25" or "Zadie's Shoes" left us with the bittersweet taste of flawed characters who struggle to create some order out of their messy lives. Unlike the hard-won resolution of those plays, "Sunday Father" ends far too neatly and with far less of a struggle. Two of the characters even become millionaires by the end, which immediately reduced my interest in them to zero. Pettle structures the play so that each character has tells a bedtime story to Jed and Amy's son. Jed tells him of the birth of Athena from her father's head, Alan tells the story of Cain and Abel and Amy tells the story of Pandora's box. Unlike in Pettle's earlier plays, the references here are far too obvious and without ironic overtones. In case we don't get it, Pettle will have Jed say, "I am Athena". No points for identifying Cain and Abel or Pandora. Pettle's writing is sharp and funny but it doesn't uncover as much hurt as in his previous plays. The playwright's brother Jordan is very good as Jed and has slowed down the pressure of speech that has marred some of his performances in the past and shifts instantly between Jed's past and present selves. It's good to see Liisa Repo-Martell in a contemporary role for a change. She is excellent as usual in portraying an intense character of conflicting, often unspoken emotions. She makes the most of her underwritten part and turns Amy's story of Pandora into one of the most riveting scenes in the play. Ultimately, the most interesting character is Alan and Ari Cohen gives an insightful, finely detailed performance. He shows us the pain gradually increasing beneath carefree, jock persona Alan tries to project until Alan breaks. Director David Storch shows the tension and insight he can bring out in a good script, unlike the lacklustre "Beard of Avon" he directed just two months ago for CanStage. He does have difficulty with the set Bretta Gerecke has designed. All white, lucite and chrome with thin metal supports at the very front holding up the white canopy of the ceiling, the set might be fine as a modern museum installation but seems unconnected to anything in the play and provides too narrow a playing area. Storch is forced by the set to stage many of the most important scenes in the play in the house right third of the set, leaving the house left side underused. My advice is to avoid seats in the house left, if possible so you won't have to spend the evening craning to the right to see. Less emotionally and structurally complex than "Zadie's Shoes" and requiring only three actors, I can easily imagine "Sunday Father" being taken up by other theatre companies looking for more commercial Canadian fare. I do hope that after this Adam Pettle returns to the more difficult subject matter and structures that made his previous plays richer theatrical experiences. Photo: Ari Cohen and Liisa Repo-Martell (foregound) with Jordan Pettle (background). ©2003 Lucas Oleniuk.